By green Chinese manufacturers are marked. Vizio also makes all of their TVs in China. In fact that we can see is pretty optimistic view for LG and Samsung. As if 4K will become hotter product things can be much worse, as all of marked companies already have 4K and 3D capable TVs for very affordable prices. Vizio — a company best known for rebranding Taiwan-made ODM TVs and selling them in middle-America box stores with the sales pitch that the consumer is “buying American”. I haven't owned a TV in years. Same here! Now where are the affordable 1080p projectors?? Now where are the affordable 1080p projectors?? Of course. 1080p projectors are not very pricy now. Anyway, they are very niche product. 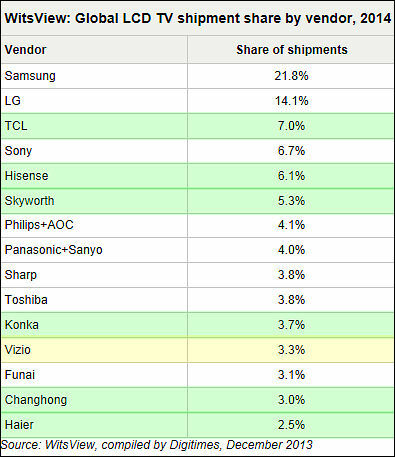 China-based brands TCL and Hisense both jumped in the shipment ranking by one spot and overtook Japan’s Sony. TCL became the No. 3 LCD TV brand worldwide with of 13.1 million sets shipped, showing a slight year-on-year increase of 0.2%. Hisense climbed to the fourth place with 12.8 million sets shipped, up 1.6% from 2014. In addition to being supported by domestic demand, Chinese brands also acquired other well-known international brands as part of their overseas strategies. With these acquisitions, they have raised their brand awareness globally and will be able to access new export channels later on. Chinese LeEco bough Vizio. Note that most TVs had been previously manufactured in Taiwan, Vizio was similar to Apple making only design. Giant Chinese television and consumer electronics manufacturer TCL achieved the No. 2 TV unit sales position in the United States for the first time in September, beating out both U.S.-based Vizio and South Korea-based LG, which had been jockeying for the rank over the past several years. TCL spokesman confirmed the data compiled by NPD’s Weekly U.S. television sell-through tracking report from its panel of top retail chains that account for the bulk of the television sell-through activity in the country. 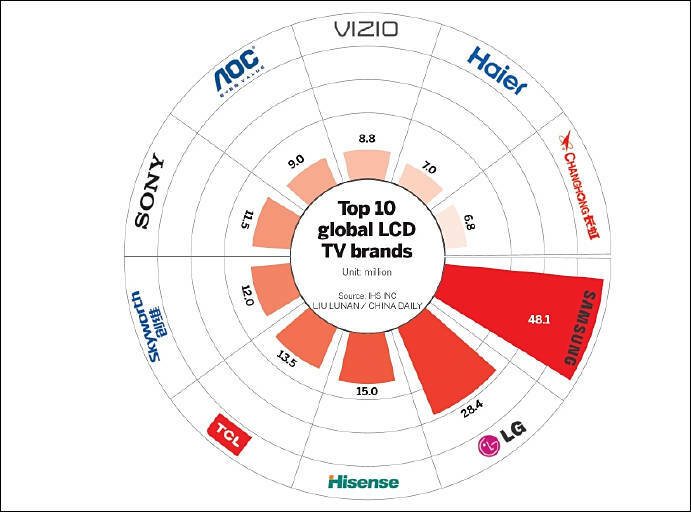 The numbers showed TCL-branded televisions moved sufficient volume at cash registers and e-commerce portals throughout the month of September 2017 to leap frog both LG and Vizio in the all-important unit sales to consumers category. TCL introduced this summer its latest lines of smart TVs powered by the Roku TV operating system, including the first models to support 4K Ultra HD with Dolby Vision high dynamic range (HDR), but its record-achieving market share performance was determined more by the high value price point the brand was offering mainstream TV purchasers through top retail accounts including Walmart and recent-addition Best Buy. Foxconn Electronics will become largest contract manufacturers reaching 16.5 million units passing TPV Technology, as it makes now most Sony, Sharp and Vizio TVs. TVP will drop to 15,3 million mostly due to dropping Vizio orders. Chinese TCL will rise 25% towards 10.4 million units due to Xiaomi orders. BOE Vison-Electronic Technology will be at 4th place with 9.5 million units.